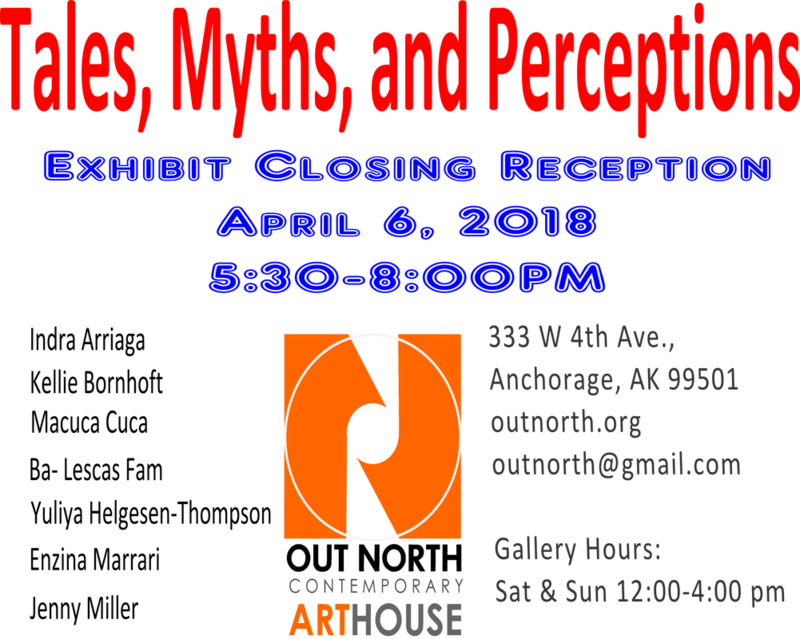 Out North is proud to present, "Tales, Myths, and Perceptions". The exhibit gives artists and viewers a place to reinterpret history, author identity, and fine-tune value systems to be more consistent with the present and thereby breaking with oppressive systems, biases, and stereotypes. Kellie Bornhoft, an MFA graduate student in Sculpture at The Ohio State University. Her video installation, “Smokey the Bear” is story that integrates both narrative and conspiracy in the telling of the ‘rescue’ of the real Smokey the Bear. The story, along with the animated visuals, asks the viewer to question their trust in the motivations of park recreation and conservation. Yuliya Helgesen-Thompson, reinterprets fairy tales and myths that are rooted deep in symbolism, nature, and story. The reinterpretation of Russian tales touches on well-­‐forgotten ancient symbols that are the basis of some ancient religions. Indra Arriaga addresses several myths across various geographies and cultures, including a reinterpretation of the creation stories that takes on the misogynistic elements of the Popol Vuh and other Meso-American tales; the Tower of Babel and communication networks; and the Myth of Orpheus and its relation to loss and desire. Macuca Cuca uses zoomorphous sculptures to delight but also blur the line between nature and the imagination. Ba-Lescas Familia are from Oaxaca’s Triqui, an indigenous people, who have faced many challenges due to land and political issues. Ba-Lescas present “Caballito Espiritual Triqui”, a sculptural interpretation of spiritual horses constructed from Alaskan grasses. These horses form part of sacred traditions honoring the relationships between different planes of existence. Enzina Marrari, is presenting beautiful work created as part of her recent residency in Ireland. Her pieces, “Morrigan” and “Macha” are part of the Irish Raven Goddess series. Out North advances contemporary art in Anchorage by presenting experimental work, supporting under-represented voices and encouraging cultural dialogue. Out North is a 501(c)3, ​All donations are tax deductible. ​Out North is a 501(c)3, your donation is tax deductible.